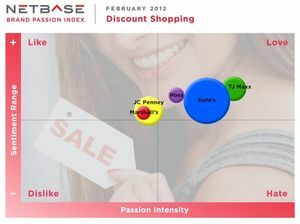 MOUNTAIN VIEW, CA--(Marketwire - Feb 8, 2012) - NetBase, the Social Media Insight & Analysis company, today announced its latest Brand Passion Index, analyzing consumer passion for five retail chains known for their economic price points. Following the nation's largest shopping season, Valentine's Day is approaching and consumers are tightening their purse strings. That's why this month's Index used the NetBase Insight Workbench to measure the emotions, opinions and behaviors expressed by online consumers for big box bargain giants: Kohl's, JC Penney, TJ Maxx, Ross and Marshalls. The Insight Workbench found that, despite its recent appearance in the market, Kohl's generated the largest share of buzz, accounting for 54.6 percent of the overall chatter. Kohl's also ranked high in other metrics with the second highest Passion Intensity, garnering a score of 68, and the third highest Net Sentiment, with a score of 61. Although TJ Maxx and Marshalls both spawn from the same parent company, TJX, their metrics did not reflect the close affiliation. TJ Maxx had the third highest share of buzz, with 14.4 percent, but generated the highest Passion Intensity score of 78 as well as the highest Net Sentiment score of 61. Marshalls, on the other hand, fell to the bottom of all three metrics. The bargain retail chain accounted for only four percent of the overall chatter and had the lowest Passion Intensity score of 45 and the lowest Net Sentiment score of 54. Verbatim about Kohl's showed that online consumers are buzzing about the store because of its great customer service and everything in between, from prices to selection to the store layout, making it a hot choice for Valentine's Day shopping. I got the best Valentines's present ever, whatever I could find in 30 minutes shopping trip in Kohls!!! Kohls has a good selection with great prices! And I love Kohl's for the return reason too! They have always been so awesome at taking things back and giving you store credit for them. Kohl's stores are effectively arranged, clean plus the shop employees, such as customer support, in our experience have been helpful plus friendly. Conversations about passion and sentiment winner, TJ Maxx, showed that its pleasant customer experience resonated most with online consumers. Social media users also noted the wide selection and discounts the chain has to offer, including jewelry, a top gift item for the upcoming holiday. I love the jewelry department at TJ Maxx. TJ Maxx has the best stuff in their jewelry department. TJ Maxx has some of the best deals around. TJ Maxx also has cheap maternity wear. FYI: TJ Maxx has some great, cheap pet stuff!!!! Marshalls diverged from sister TJX company, TJ Maxx. According to verbatim surfaced from online consumers, the poor customer experience and shabbiness was a common theme in complaints. I HATE Marshalls -- I always buy something there that never fits right! I will never shop at marshals clothing store and I recommend that no one else does either. Marshals is kind of dirty. This Marshall's is also pretty nice, but it lacks the designer and home goods sections. Each month, the Brand Passion Index analyzes consumer passion for brands in various categories and publishes the results on the NetBase blog. NetBase delivers the social intelligence that global enterprises need to make smarter business decisions faster, making it possible for them to become next-generation customer-to-business (C2B) companies. Built on the most advanced natural language processing (NLP) engine, our insight and analysis solutions help decision makers listen carefully to what consumers are saying on the social web, understand their opinions, passions, and behaviors, and act confidently to improve their social media P&L. Serving hundreds of corporate customers, our products were developed in partnership with five of the top 10 CPG companies, including Coca-Cola and Kraft, and are used by leading agencies, including GfK and J. D. Power & Associates. NetBase powers the weekly Sentiment Tracker report in the Wall Street Journal and its solutions are sold globally by SAP AG. For more information, visit http://www.netbase.com/, @Net_Base, our Facebook page, LinkedIn, or YouTube. In this graphic, the amount of chatter about a brand is indicated by the size of the bubble, while the placement of the bubble shows the sentiment and the intensity of passion.